Economy: what immediately comes to your mind when you think of that word? Maybe, “cheap, frugal, savings, bargain,” etc. Sometimes there’s more than meets the eye when we’re looking to save money, and I’m about to tell you one of these tricks. In my consulting work, sometimes I have to travel, and that includes renting cars. Sometimes economy is not the cheapest. 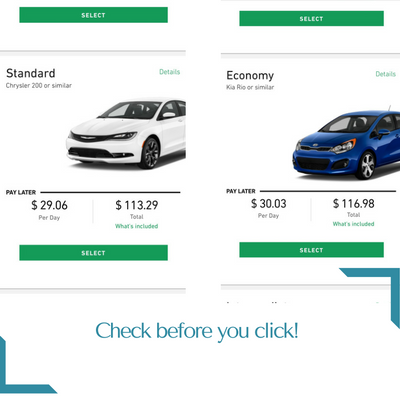 All car rental companies modify the price of their available vehicles based on demand, the time of year, their location. These rental companies know that a lot of travelers, or people who book travel, look for the “economy” key word in order to meet expense reimbursement criteria. As these pictures clearly illustrate, sometimes that can be at your own cost. Take a look at the actual sample vehicles, not just the price. Even when you find a price within your comfort range, consider whether that’s the real price, or if you will have to select additional options. Consider also that some rental companies lock you into that specific car that appears on your reservation. Unless you participate in their rewards program and have attained a certain level, changing to a different vehicle may cost you. That’s a major reason why I “go with National” on most trips, both for business and personal use. When I reserve, a type of car is reserved for me. If it so happens that in reality that car is not comfortable for me to drive, I can go down the aisle and select another one. There’s no need to go back to the counter and rework my reservation, which, with some rental companies, can bring additional fees. If you’re on a family vacation, consider also that where you rent the car makes a difference. If you’re in a metropolitan area where that same brand has pickup locations not too far from each other, you may want to pick up a car away from the airport. Many cities impose airport-related fees on top of those costs. Perhaps, it might make more sense to take an uber to your hotel, and then rent from a pickup location at or near your hotel. Did you know that only a few companies run the rental car market? It’s true! How can it benefit you? If you participate in the rewards program of one of the brands within a family of companies, the other companies will often recognize your ID number. This way you can save money with one brand, but still accumulate points overall. There are some minor restrictions about redemption, but overall, you can find a good deal. If this blog helped you, be sure to share it with a friend!